Learn to simplify and solve algebraic fractional expressions and equations. This is the fifth program in the "Algebra By Chapter Series". The operations of addition, subtraction, multiplication, and division on fractions (rational expressions) are very challenging topics for students. 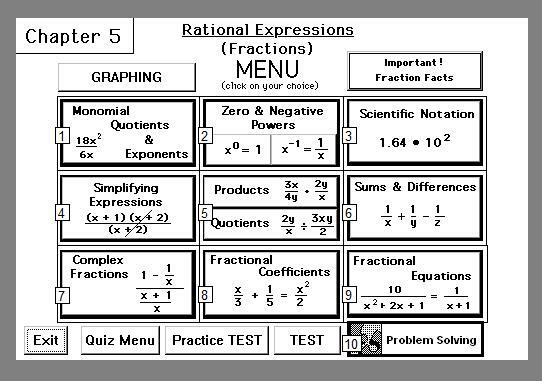 Since math fractions are always difficult for most students, the study of rational expresions begins with the review of the basic operations on numerical fractions before advancing to simplifying rational expressions ( algebraic fractions ), reducing rational expressions and operations with rational expressions. 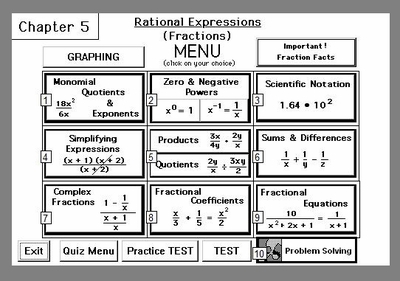 Begin the study of rational expressions (fractions) by reducing rational expressions and simplifying rational expressions. Also, included in this program are negative exponents and scientific notation. Once the student has thoroughly learned how to simplify negative exponents, they move on to simplify complex fractions, simplify rational expressions, and then solving rational equations is practiced and learned with step-by-step algebra help. The study of algebraic fractions concludes with a word problem section using the learned material on rational expressions from the body of the program. Solving rational equations is a key concept required for more advanced math studies. 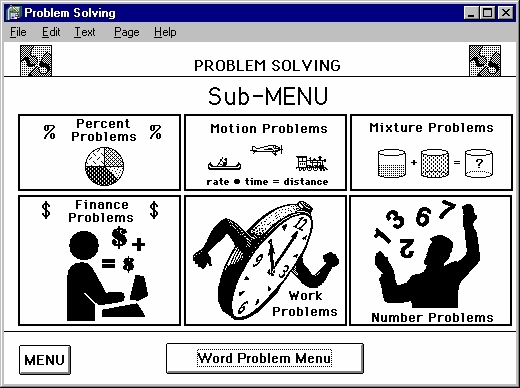 Topics included in this algebra software program such as adding and subtracting algebraic fractions, multiplying and dividing algebraic fractions, simplifying complex fractions, using exponent rules and multiplying with negative exponents are all included on the S.A.T., the A.C.T., pre-calculus courses, college math placement exams, college algebra, and the CLEP exams. This is one of the most difficult topics students will encounter in their journey through the study of mathematics... This algebra software will make that journey much more understandable and, therefore, enjoyable! Algebra help is always available.